A feminist activist holds a sign with a message reading "We are the majority" during a protest in the Kremlin on the International Women's Day, March 8, 2017. This year's International Women's Day was marked by feminist protests in Moscow and St. Petersburg. Experts note that the idea of gender equality remains unpopular in Russia. “March 8 is the day of women's solidarity in their fight against gender inequality, not the day of spring, femininity, and beauty,” read a poster held up by a young woman at a feminist march in St. Petersburg. This is not an obvious statement in Russia, where International Women's Day has long been associated with bouquets of tulips and presents for women, not with protest actions. This year, however, Russian feminists decided to remind people about the true meaning of March 8. Marches were staged in Russia's two largest cities. In St. Petersburg, around 50 female activists walked down Nevsky Prospect, the city's main thoroughfare, carrying posters with demands for equal pay, protection against violence, and reproductive freedom. Authorities had not been notified about plans to stage the march - a legal requirement in Russia - and 14 participants who were detained now face fines or 15 days imprisonment. 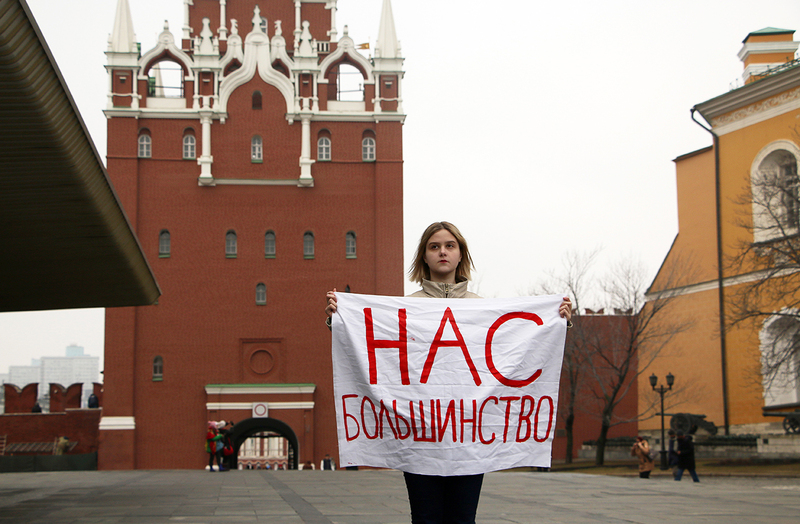 The feminist action in Moscow targeted the Kremlin, the primary stronghold of Russian state rule. There were other, no less radical slogans: “A woman for president!”, “A woman for patriarch”, and “Men, out of the Kremlin!”. In fact, activists stressed they were not demanding that all male public servants be sacked, nor challenge the authority of Patriarch Kirill. “Slogans need to grab people's attention; they are nothing more than a way to raise people's awareness of topical problems,” one protestor, Leda Garina, told Radio Liberty. Feminists believe there are many problems with gender equality in Russia: Women are paid less than men for the same job, male candidates have a better chance of securing high-status positions, and domestic violence is widespread. The protesters claim that one in three Russian women have been subjected to violence. Police detained women protesting outside the Kremlin but later released them without formal charges. “It is your day after all,” Novaya Gazeta cited a police officer as telling the protesters. Public actions in support of women's rights are a rare sight in Russia. Even the massive Women's Marches, which gathered around 5 million people around the world following Donald Trump's inauguration as U.S. president, passed the country by. Political analyst Mikhail Vinogradov, head of the St. Petersburg Politics Foundation, believes the latest rise in feminist activity has to do with the International Women's Day and nothing else. “The activists are attempting to breathe new life into March 8,” Vinogradov said, adding that the date was once celebrated as the day of women's solidarity in their fight for emancipation. In Soviet Russia, however, March 8 was transformed into the day when men would compliment women and give them flowers. The equality aspect of it was effectively forgotten. Psychologist Pavel Ponomarev told RBTH he doubted whether Russian society needed feminism at all: “It is a universal belief over here that gender equality has already been secured in Russia, and that there is nothing left to be fighting for. This is not necessarily the case, but there is no massive interest in feminism.” Ponomarev notes that individual activist cells - usually viewed by the public with skepticism and suspicion, characterize Russia's feminist movement. Garina agrees that feminism does not enjoy widespread support in Russia: “Most women accept what is being imposed on them [that there are no gender equality problems in Russia]. It is my job to enlighten them.” Garina hopes that in the future, March 8 actions will help make more Russian women aware of gender-related problems and motivate them to fight for their rights more actively.